My brother Andy and I found out about the treasure the way most people did; it was one of those daily news items that everyone shares the next day. 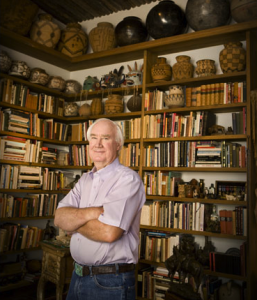 Some eccentric old man named Forrest Fenn had hidden a box full of gold “somewhere in the mountains north of Sante Fe” and was daring people to go search for it. He had published a memoir of his life with a poem containing clues that–if followed precisely–would lead straight to it. All you had to do was decode each cryptic stanza and navigate the wild backcountry for instant wealth and a story fit for Indiana Jones. Forrest’s memoir, titled The Thrill of the Chase, was published in 2010 and word soon got out about it containing clues. Ever since, thousands of adventurers have been scouring the Rocky Mountains with the book in one hand and a shovel in the other. People are cleaning out their savings to buy airline tickets and metal detectors and posting theories all over the internet. 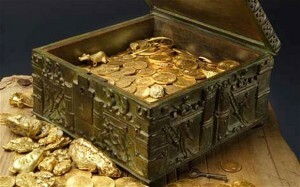 To understand the excitement, just look at the pictures of the treasure: it’s a massive stash of gold coins, jewels and nuggets, with everything tossed in wily-nilly like the booty of a careless pirate. But the treasure isn’t some high seas contraband, it’s really the pinnacle memento of a master collector that tells of a lifetime of exploration and discovery. Between the egg-sized nuggets of pure gold, there is an assembly of rare artifacts including a 17th-century Spanish emerald gold ring, a 2,000 year old Indian necklace from Columbia and an antique dragon coat bracelet with 260 rubies, emeralds, sapphires and diamonds. There’s also a special silver bracelet with turquoise beads excavated from Mesa Verde that Forrest won in a game of pool. Even the chest is a rare cast bronze Romanesque Lock Box that Forrest purchased from a museum curator for what he calls an enormous sum (as it was “the perfect treasure chest”). Many objects are priceless pieces of art making it hard to say how much the complete treasure is worth. But some have tried and the current estimate is around USD $3 million. That’s enough to get people off the couch and searching around their shed for the shovel. Forrest Fenn at his home in Sante Fe. Andy and I had the book and were determined to give the chase a good attempt. We had done quite a bit of amateur geocaching before and I had dabbled in the MIT Mystery Hunt, but hunting for real treasure was stepping into the pro-leagues. To have an honest shot at locating it, we knew we had to read the memoir carefully and learn everything about him: about his summers in Yellowstone fishing with his father, and the collections of marbles, pottery and arrowheads; about flying fighters in Korea and Vietnam, and opening the successful art gallery in New Mexico; about the visits from Presidents and school children, the struggle with cancer–with a 20% chance to of survival–and the waterfall. 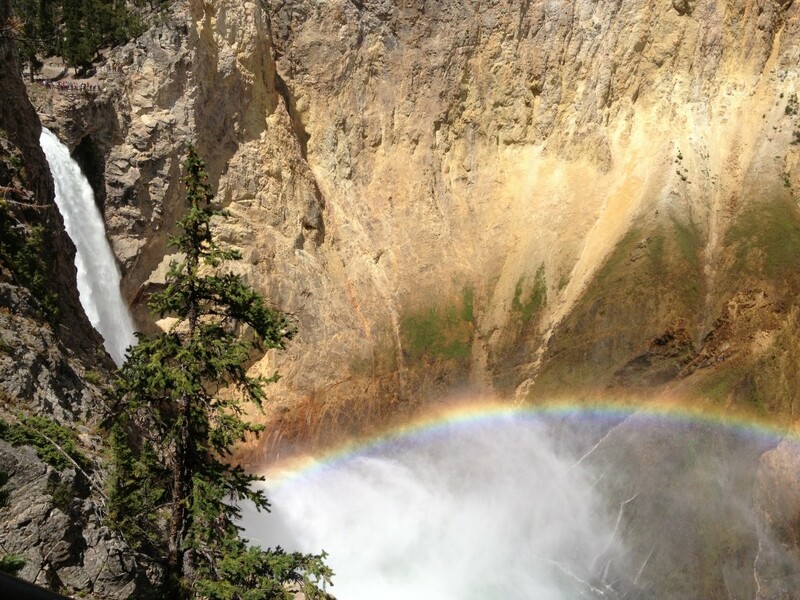 From reading his books and blogs, The Journal of a Trapper, and the countless reports from fellow searchers, we built up a plan and bought our tickets to the place that we felt was the most promising: Yellowstone National Park. This is our interpretation of the poem, the adventure it led us on, and the amazing discovery we found at the end. The Fenn Poem consists of the following 30 lines. I give you title to the gold! 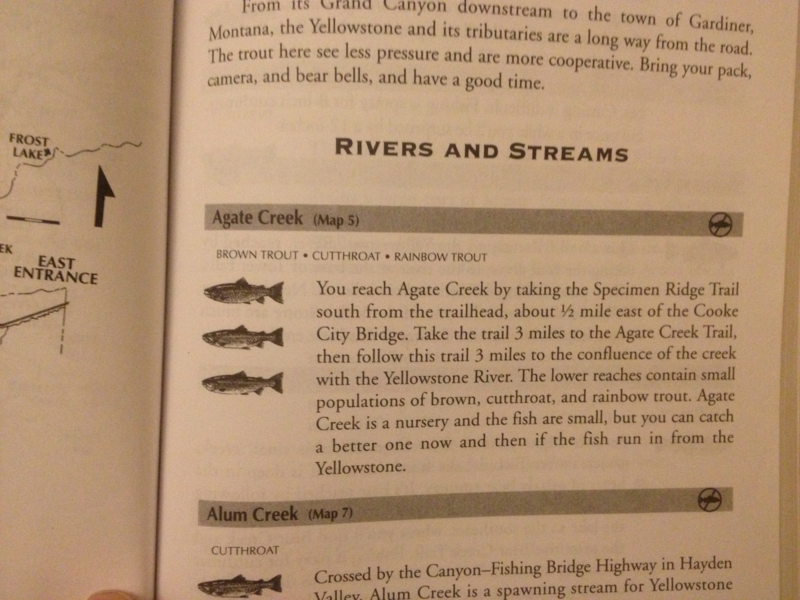 This page from the book Flywater shows a beautiful set of rainbows in Yellowstone. Many times throughout the memoir, Forrest recalled his most indelible moments fly-fishing the waters around Yellowstone. “Those great places were personal secrets to me then,” he said. Was “the end of his rainbow” a secret fishing hole of his? It wasn’t clear at first, but in our mind this emphasized the importance of trout fishing to interpreting the clues. This line begins the nine clues within the poem and is often interpreted as a specific hot spring or geothermal source that terminates in a colder river or lake. But with our previous insight we felt, warm-waters seemed more likely to be the common fishing term meaning waters that support fish other than trout and salmonids. Where warm waters halt is then where the fishing is exclusively trout. Forrest has revealed that the clues give directions in order, from start to finish, and they probably refer at first to broader areas and then to a more specific place. Many people think “where warm waters halt” is itself a small spot (perhaps because it was originally thought that the treasure was near Sante Fe). Theories include local hot springs or even outhouses (think about it). But with a small spot in the broader Rockies, the Poem’s solution would hinge almost completely on this first and most difficult clue. This isn’t Forrest’s style. It seems more likely that “where warm waters halt” is a general region that would be only a step on the journey. As one looks north along the Rocky Mountains, the climate becomes cooler and warm-water fishing such as bass, sunfish and walleye diminishes. Yellowstone–the gateway to trout country–is the point where warm-water fishing completely ends and the best trout fishing in the world begins. Therefore “where warm waters halt” is Yellowstone itself as a whole. Of course, there is also a clever double-meaning here as Yellowstone is on the largest super-volcano in the continent and is home to an amazing array of hot springs, geysers and other geothermal “waters” that emerge into cold rivers. As the first national park and treasure of the United States, it became clear to us that the whole evolving and dynamic landscape of Yellowstone, the home of Old Faithful and many mountains, rivers and trout streams is the answer to this first clue. Well that settled it. Andy and I flew in to Salt Lake City that May–he left school from Chicago and I took off from work in Boston. We rented an expensive economy car (apparently Enterprise doesn’t care if your 25th birthday is only a week away) and we headed straight to Yellowstone. 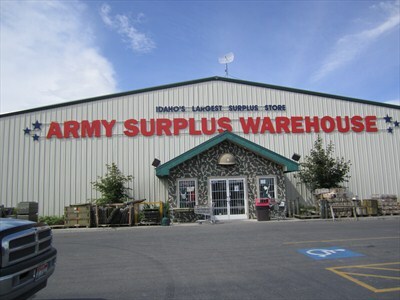 We stopped at an impressively stocked Army Surplus store in Idaho Falls and made sure we had all the necessary gear. Military sleeping bags, matches, knives, road flares and bear spray. We needed to be ready for anything! The Army Warehouse has everything you need to go treasure hunting! When we looked at our map of Yellowstone, we realized there were hundreds of canyons in the region; every little valley or depression was called a canyon around here. How could we possibly find which one was the canyon? We started searching a few at random but when we stopped in Canyon Village in Yellowstone, it was clear there was only one answer worth being the right one–the canyon of Yellowstone–what people call the Grand Canyon. The name doesn’t need to convince you, one step inside and you know that Forrest would have a hard time going with another place. Our first glimpse of the Lower Falls in the Grand Canyon of Yellowstone. The prominent yellow stones on its banks actually gave the park its name and the Upper and Lower Falls that mark its beginning are some of the most beautiful in the world. The waters descend from these falls and run north surrounded by the canyon walls on either side. Here the water is known as the Upper Yellowstone River. 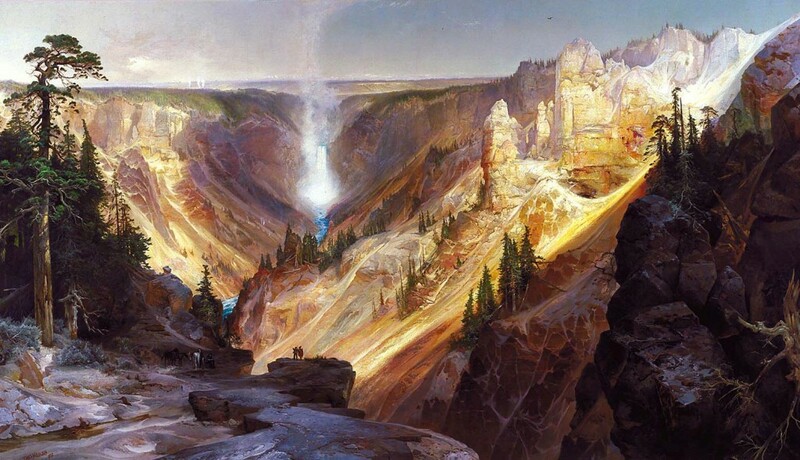 The Grand Canyon of Yellowstone in a painting by Thomas Moran. 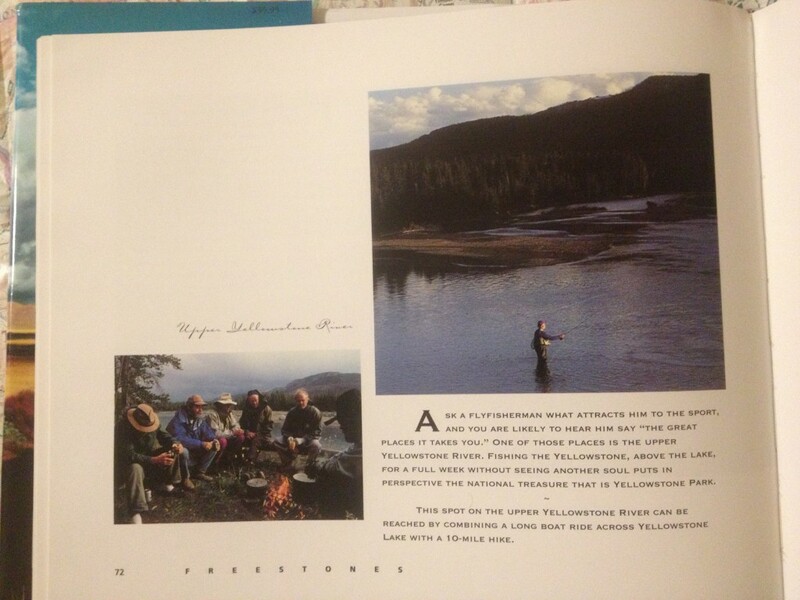 Page 72 in Flywater – the Upper Yellowstone River. 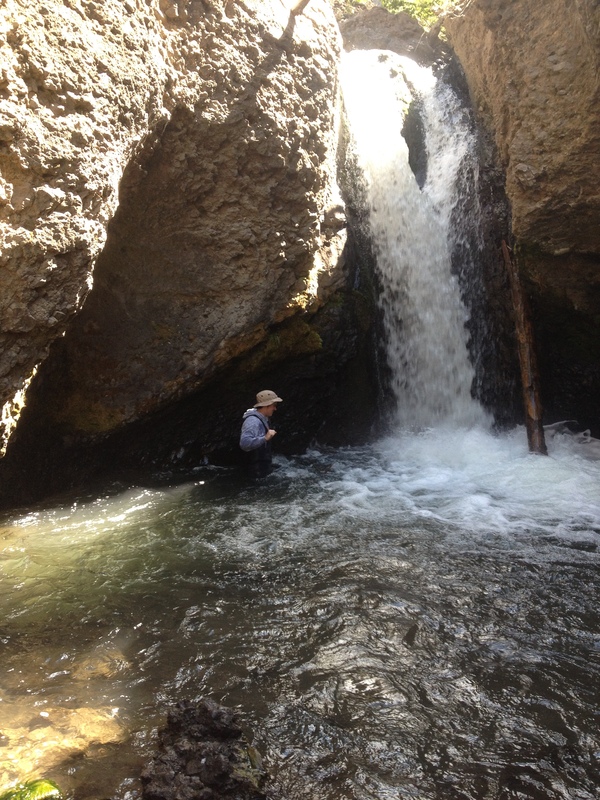 When we made it to the Canyon, we took Uncle Tom’s trail to the bottom of the Lower Falls. There we were greeted by one of the most magnificent rainbows we had ever seen. Again the rainbow was leading the way. But where was the end and how would we interpret the next clue? Well it was immediately clear this canyon was too far to walk, which was good because most other canyons on our map looked quite walkable. Trying to descend the trails directly from the Falls into the Canyon soon leads to impassable narrowing walls. The Yellowstone River here isn’t tranquil. It is swift and strong and going further requires rafting (through class IV rapids, according to our maps). Is this what Forrest meant by too far to walk? Probably not as rafting is illegal within the park and while Forrest is fit for an 80-year old man, he isn’t that fit. On the other hand, the next clue suggests that there is a trick to “put in” to the river in the right place. This is the hardest clue to figure out. Many have suggested that the home of Brown may refer to the home of Brown Trout. This seems like a great answer except that a search of the internet seems to show that there are no Browns downstream from the canyon in the Yellowstone River until Knowless Falls–all the way in Montana. Many treasure hunters have searched there to no avail, some almost getting killed. Forrest had even gone so far as to say it wasn’t safe enough for an 80 year old man like him to put it near Knowless. But the Brown Trout interpretation was too good to pass up. If we couldn’t find another spot, we’d have to search Knowless. Feeling exhausted from our second day of hiking, I let my brother continue exploring the main canyon while I hunkered down to browse fishing books in nearby Canyon Village. It was with incredible luck that there I came across the perfect answer. You must really consult the locals for this one, but there are Brown Trout below the Lower Falls and much nearer within the park than Knowless. 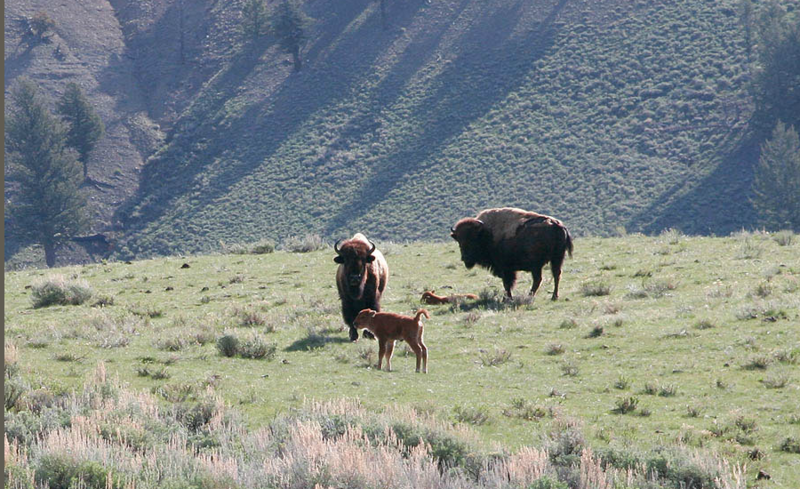 Their home is a small nursery stream called Agate Creek–which runs into the Yellowstone River only 10 miles downstream (north) from the Grand Canyon. Very few people know about the Brown Trout here, there is nothing about it online, and even most of the fisherman we met there don’t know that Browns are in that creek. 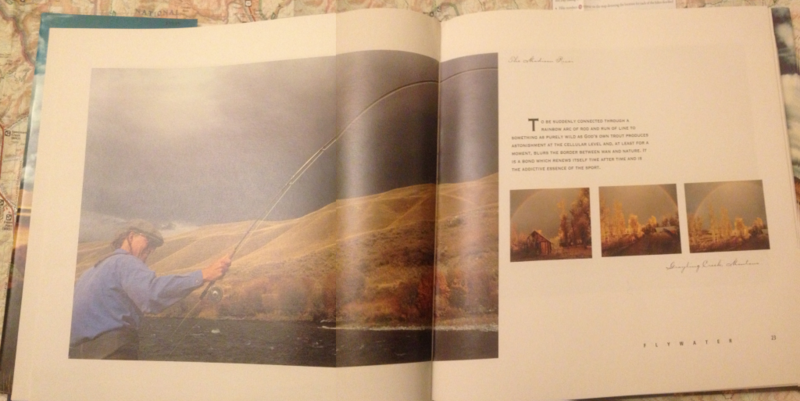 The only printed reference I can find is still that original book The Yellowstone Fly-Fishing Guide. The page of interest (pg. 59) is shown below. Brown Trout are indeed found at Agate Creek. At this point we did some further research and things became even more interesting. This creek was in the Lamar Valley–the least explored and most virgin part of the park. A place described by Osborne Russell in Forrest’s favorite book, The Journal of a Trapper, as a beautiful valley filled with wildlife, history and significance to the Native Americans. Even now there are tales of spots in the Lamar that few people have ever seen, like the Fairyland Basin [YouTube]. 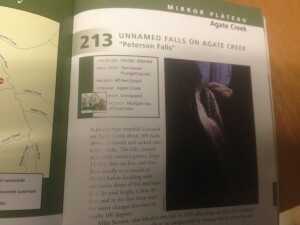 The book indicated a trail called Specimen Ridge leads to Agate Creek. 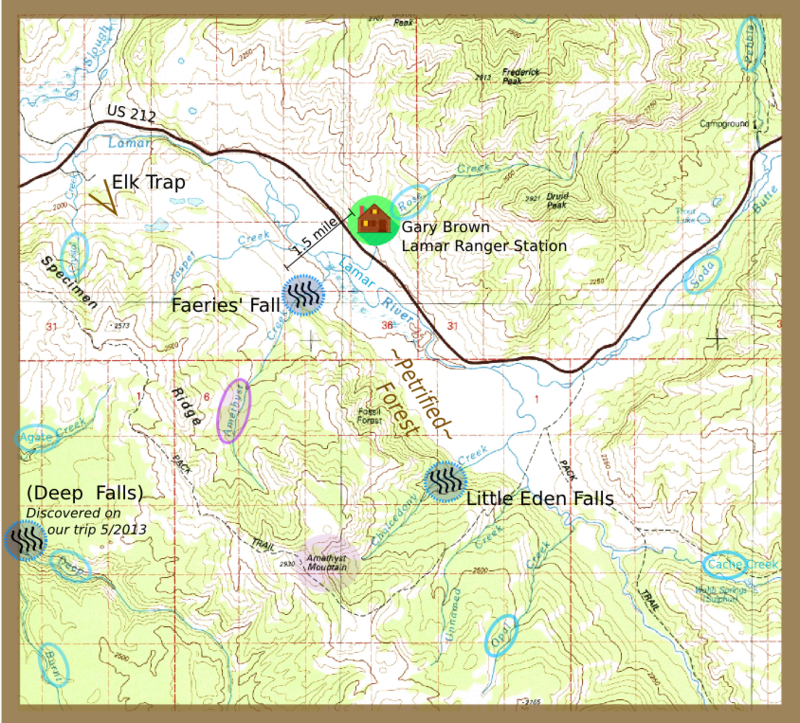 We researched the area and found that the trail winds along rare geological features including a petrified forest. This forest is not widely publicized but is known by scientists to have one of the best-preserved root systems in the world. We read blogs about other hikers who had taken the Specimen Ridge trail and they mentioned seeing burned out trees from the great fire of 1988 (coincidentally, the same year Forrest was diagnosed with cancer). In some places the only trees that survived were these petrified ones memorialized in stone. We hadn’t even known what agate rocks were before learning about this Agate Creek trail, and here it was, a strange line in his book connecting the agate marbles from his childhood to a creek on the Yellowstone River. We were on to something. It was clear that “put in below” meant into the Yellowstone River from the confluence of the creek. But was it up-stream or down? What would we find along the bank? Looking at the map again, there was another creek less than a mile up the Yellowstone and totally inaccessible. It was called “Deep Creek”. What was at Deep Creek? We would have to find out. The Gardiners Island he refers to is ostensibly the famous one of Captain Kidd off the coast of Long Island, NY. But it was strange, that island doesn’t have an apostrophe in its name. Did he mean this Gardiner? The north entrance to Yellowstone–“Gardiner’s Hole” in earlier times? We didn’t sleep much that night either. We drove into the Lamar Valley and soon came to the Specimen Ridge trailhead. We were greeted by plains of sage brush dotted with bison, some rearing newborn calves and a steep ridge in the distance. The trail ran right through clusters of bison that we would have to avoid, and then, straight up the ridge. We started out down the trail and tried to weave around the bison. A few eyed us warily. In a given group it was always the closest buffalo that would keep watch while the rest would seem to ignore us. Seemed like they had a system. Forrest’s story about Cody the Buffalo came to mind. It was hard to imagine how he could sneak up and rope that thing without it seeing him. We continued to approach the ridge when suddenly a group of four or five bison further up began barreling down straight towards us. We froze. They came closer and closer until with fifty feet left they finally formed a line and veered to the right. The leader’s giant tennis-ball eye followed us as he crossed on by. He seemed to give us a warning–we were in his territory now. We would have to be careful with these guys. We were looking up now at the trail going straight up the ridge. It was steep. Could an 80 year old man really haul a 42lb chest of gold up this? If he did, I’m sure he was chuckling to himself imagining our faces contemplating it. We wrestled to the top and eventually met a multitude of petrified stumps. They had beautiful crystals embedded among the rings. “If you’re brave and in the wood”–was this what Forrest was referring to? We couldn’t be sure. But Agate Creek was our real destination and we had to continue on. The path wasn’t always clear but we knew it went along the ridge to the south. At length we came upon a pond on Specimen Ridge. Many prong horn and bison were congregating here. The trail went nearby the pond and one giant buffalo was sitting directly in the path. We decided to veer widely away to the west. There was a valley gathering this way and it seemed to drop right into the Yellowstone River canyon. We must be close I thought. As we descended, a creek started to gather. Was this Agate Creek? It was pretty clear it wasn’t a trail. It was a steep 45% grade in some places with crumbling rock. We kept a lookout for clues and found beautiful rocks and dozens of shed white antlers along the creek bed, but nothing definitive. Finally, after over an hour of descending, we make it to the bottom. Our first hike took a wrong turn down Quartz Creek (yellow) but the following trips followed Agate Creek Trail (orange). When we made it to the Yellowstone River, the outlet was not what we had expected. 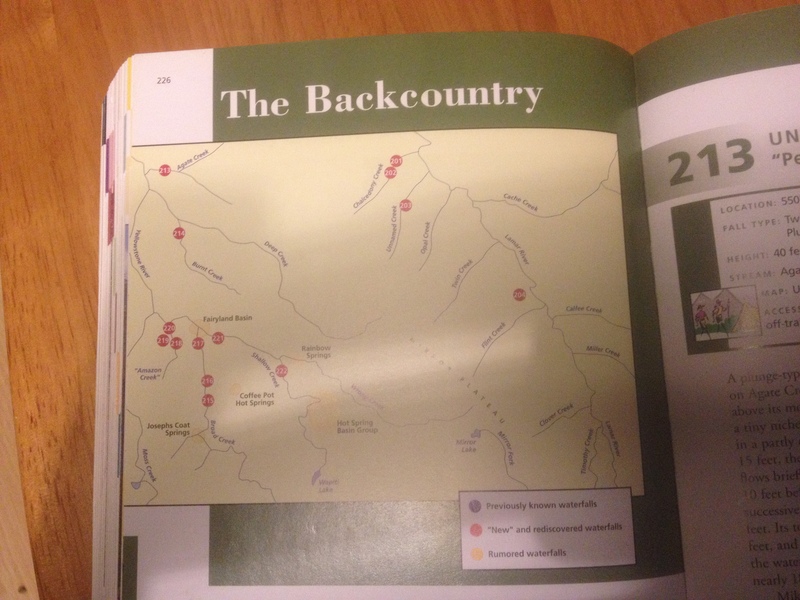 Looking carefully at the map it became clear why–this was Quartz creek. We had descended too early, many miles before Agate Creek. Andy had suspected this all along but I was too busy looking for clues to listen. Oh well, at least we would get a look at everything downstream of Agate Creek. 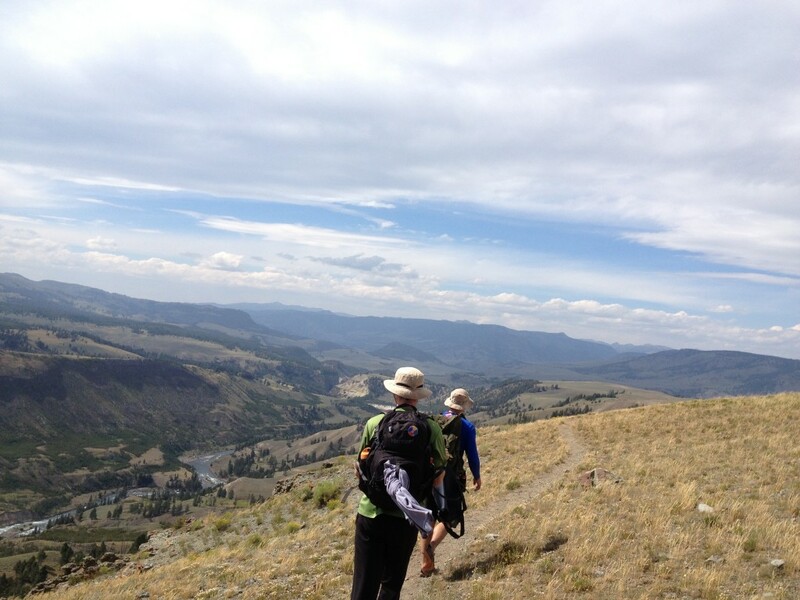 Trekking south up the Yellowstone River was far more difficult than we expected. The bank is extremely steep and rocky. We would set off little avalanches in many places as we tried to stay out of the water. It was slow going over many hours and while we didn’t find anything specific along this stretch of river, I should say that it was magnificent. At great length we made it to Agate Creek. We were tired–exhausted really–and out of food. It took some time to confirm that we really had made it to Agate Creek. We were worried when we didn’t find the path that we were supposed to have descended. We needed that trail because we weren’t about to return the way we came–we simply didn’t have the energy for it. But finally we found it back in the trees. Then there was talk of going back now. Ankles were swollen, toes were bleeding. Any more traveling along the bank was foolish. 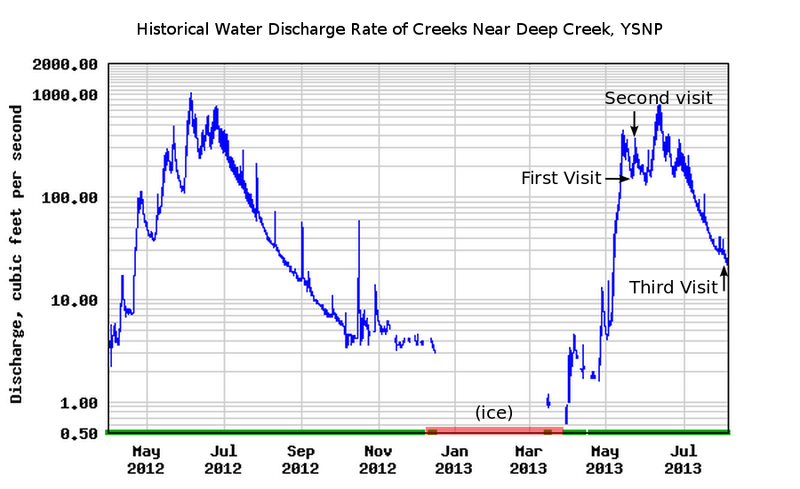 But Deep Creek was less than a mile upstream! We had to continue. On the other hand, I’m not sure we would have tried this last stretch if we hadn’t already traveled so many miles up the river to that point. Here, the bank was even harder to navigate, crumbling rock with little to hold on to. We had an occasional fall into the freezing waters. Andy lagged behind saying he might go back. But I had to see what was around the bend. We had come too far to turn back now. After another hour I came upon a great stone face and impassable boulder–just before the spot where the entrance to Deep Creek should be. This was where we’d really have to take the plunge. The water was the only way around. It was deeper here and cold. Alright then. I leapt in over my waist and was thrown under, fighting the current to get upstream. Clinging to a rock I pulled up and crept soaking back onto land on the other side. I had made it. Here there was a clearing, with trees and brush and a roaring stream. It was the Deep Creek. This place had not been visited in some time. There was an accumulation of dead trees and delicate moss on the rocks that broke off with the slightest touch, it must have been undisturbed for years. Giant rock spires stood a thousand feet above all around. The creek bed cut through an impossibly deep channel, rushing through the narrows. No wonder we hadn’t see anything in the satellite views, this spot was hidden from all angles! There was a sense that this was an important place, perhaps known to the Shoshone or the Blackfoot indians; a kind of ancient hideaway still kept secret from modern man. I still could only see trees and rock, but heard a roar further on. Was it the waterfall? A palpable wave of adrenaline pushed me forward. There was a large boulder blocking the way up, but looking carefully there were a few holds on the rock, almost worn from a primeval time. I cleared the boulder and looked up. A beautiful waterfall rushing into a large black bowl of rock. This basin of water was surrounded on all sides by the walls, protecting the pure mist that was kicked up from within. And in the center, a single rainbow formed by light cutting down through the mist from above. Absolutely beautiful. I stared for what must have been a minute and then looked down at my feet. There, sitting all by itself, was a single Indian arrowhead. And it was pointing directly at the waterfall. A gift from Forrest? This was it. I knew we had found the place. I couldn’t even speak. I backed away and tried to call for Andy to come. The words barely came out. 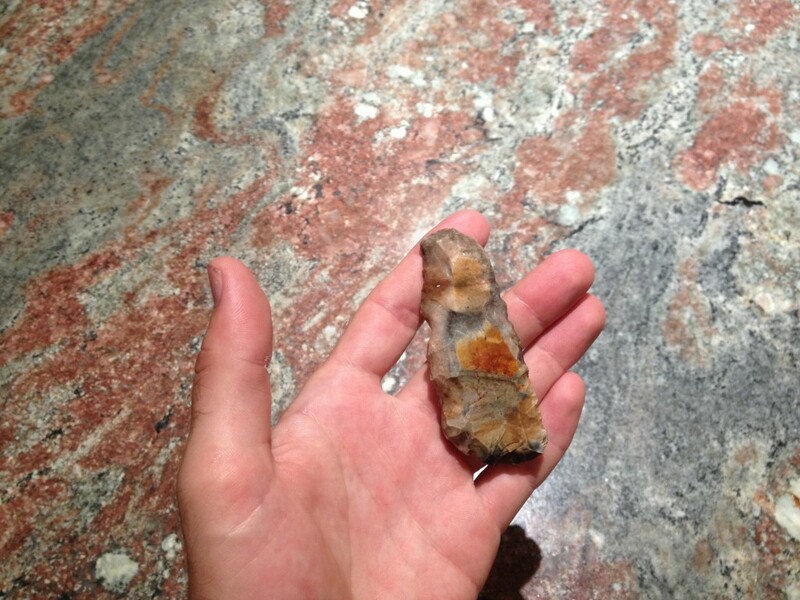 The arrowhead found at Deep Creek. I could finally hear Andy coming near. He scaled the boulder and stood dripping next to me. He looked tired and unamused. All I could do was stand and point at the waterfall. I showed the arrowhead in my hand. He looked at it again. I couldn’t believe he was doubting we had found the right place. It was time to retrieve the treasure. But where was it exactly? There was a kind of hollow in the rock to the right of the falls–large enough to stand within. This “cave” was covered with moss on the inside. We had read rumors of a place by the treasure that Forrest planned to crawl into and die; an earlier version of the poem had purportedly said “take the gold and leave my bones”. Was this a place where he had considered leaving the earth? We searched around the cave but it was pretty clear the chest wasn’t there. In any case, it felt wrong to disturb the area. We searched everywhere nearby, but there was no question about it. When Forrest said, So hear me all and listen good, Your effort will be worth the cold.–he meant we needed to get wet–really wet. The bronze chest full of gold coins, figurines, bracelets and jewels must be directly behind (or below) that waterfall. The water levels in Yellowstone were at an all-time high for the year. Hundreds of cubic feet of water–or ten bathtubs–were coming down per second. But Andy used to be a lifeguard, so I felt ok jumping in. The water was colder than I can possibly describe. It originated from snow melt far in the Lamar valley and was isolated from the sun by the deep canyon walls all the way down. The black basin of water was deep itself and the current swift. I swam frantically toward the falls. This was going to be tough. The current threw me back out of the basin faster than I could swim and I ended up even further away. Trying over and over again was no use. I tried climbing along the walls to jump in but after continual failure had to let it go. The water levels were just too high. It was impossible to get near the waterfall; we would have to come back when it was lower. Defeated, we made the long journey back–this time taking the correct trail. Andy was still skeptical about what we’d found. I had thought about that. “It fits perfectly with a search group rafting down the Yellowstone River but going right by the creek.” It seemed reasonable that a few of the thousands of searchers would have tried rafting down the river and told Forrest about it. But his main point remained–how could an 80 year old man have made this journey with 42 pounds of gold? I had to admit, it would have been incredibly difficult. It was a long drive back to the Jackson Hole airport. Andy dropped me off. He had another couple days there and was going to check a different place he thought was better–one that was a lot easier to get to. I had to get back to work in Boston. While waiting for my flight I traced through the pages of the Thrill of the Chase one more time. Agate rocks, petrified forests, arrowheads–it all fit too well. But how would Forrest have done it? That trail was just too steep and perilous for an old man carrying such a big chest. I looked at the map again.. what was this? Agate creek is also a horse trail? That could be the answer! Forrest took his horse. This really had to be it! We had to give it another shot. I sent an email out to work. Something had come up, I would be gone for a few more days. I cancelled my flight and booked another for two days later. Then I tried to get Andy to pick me up. No response. There was no reception for him in the park. OK, well I would have to rent another car. Enterprise had a counter but they would probably ask questions if they noticed I already had a car out with them. Avis it was (and still not 25 yet, darn!). I picked up some gear. This time we’d be prepared: a helmet, 2 pairs of swimming goggles, rope, neoprene waders, snorkeling equipment, and–most importantly–a pool noodle for breathing six feet underwater. Well to make a long story a little less long, after hiking all the way back out there (this time taking the correct trail) the bottom of the waterfall was still unreachable. The water coming down was just too strong and the water too swift. The pool noodle worked fine for breathing.. but that wasn’t the problem–it was physically getting to the waterfall without being thrown back by the flowing water. Goggles weren’t much help either, with all the air bubbles, I couldn’t see a thing. I tried and tried but was beaten back every time. We’d simply have to come back another time. Back in Boston, we planned our next trip. It turns out the water levels in Yellowstone fluctuate dramatically over the year. Looking at the USGS historical water flow data in the region, we determined that August was the earliest we could realistically return. This time we would bring the whole family along. My youngest brother Tom accompanied Andy and I on the hike. When we made it to the waterfall, we found the water was indeed about 5 times lower. It was still quite a challenge, but this time it was possible to swim underneath it. Andy by the Deep Creek waterfall during ‘low water flow’. The water drops 6 feet deeper just ahead of him. Sadly, all we came up with was gravel. We scoured the bottom and didn’t find a hint of anything. There did appear to be some sort of depression into the rock deep under the water that we weren’t able to explore completely. It seems unlikely that Forrest would go down in there to plant the treasure though. Only after coming here three times did it really sink in just how challenging it is to get to this spot. We are still exploring other possibilities in the area, but as far as we’re concerned, this one is a dead end. Still, the thrill is absolutely in the chase and we will be planning our next search in the spring! The long journey back was not without its perks. Map of Northeast Yellowstone Lamar Valley near Specimen Ridge. Beautiful documentation. Sounds like the perfect summer vacation…. So now that you know where the treasure is not located…are you planning another trip? Thanks Dal. We really enjoy reading your blog about the treasure hunting–it inspired us to write this. 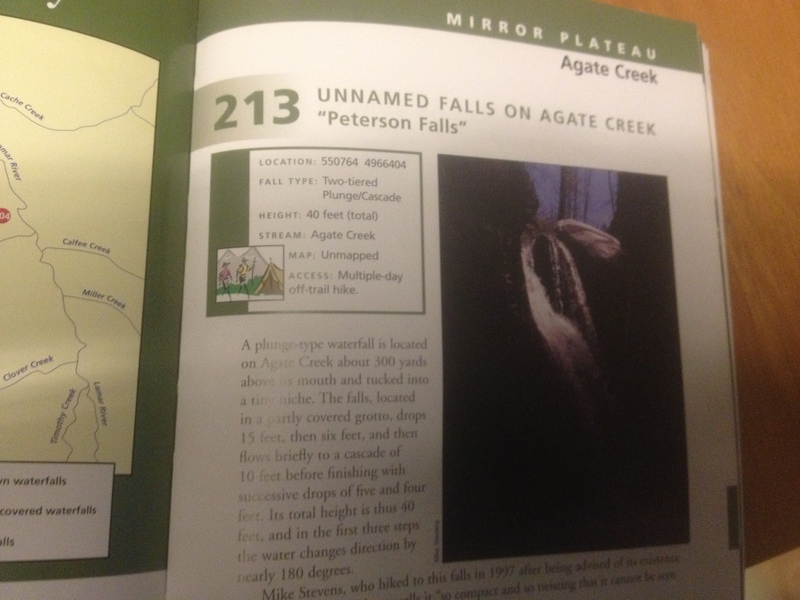 The top of the todo list is this new Agate Creek Waterfall (from the waterfalls book, see above). We had not known about it until a few days ago. Can’t believe you took the time to write this up. Hopefully no one else explores your next waterfall first now that you’ve publicized it to the world 🙂 Awesome write up though! I’ll check Big Sur for you. Wonderful story,,,, thoroughly enjoy every line….best wishes and good luck in your searches..
What an awesome story. This is what the chase is all about. Good luck to you on your other waterfall. Let us know what you find. Really enjoyed reading about your adventures and seeing your pictures – great story and very well written! I have thought about the Yellowstone River area as a great place to start too as many of the clues seem to fit that area well. 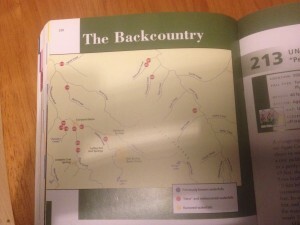 Thanks for posting the pages from Flywater too as I have not been able to find this book locally. Great story and beautiful pictures thank you guys. Buffalo are strange beast in that they are very unpredictable. It looks like you guys had a great time out in the woods. After all this is the premise behind Mr Fenn’s treasure hunt. By the way as a side note I found a copy of “Flywater” in my local library. Sounds like a great adventure and one that only great planning for the coming season can top. It reminds me of my 4 trips to Yellowstone. And yes, I am one of those crazies who almost died. Good stuff though and The Thrill continues…for you and me… Be Safe and Good Luck! Cool! Glad a fellow alum found the site! I can understand your appreciation for Yellowstone, the geology is fascinating. I’d never seen anything like the hot springs there and the cyanobacteria blooms are unreal. That’s interesting that you came about similar ideas. There is one other person that contacted me and said they searched along Agate Creek and came up dry. This certainly feels close if anything. I’m very curious about your location, is it still within the park? One last piece of information.. I sent this link to Forest and noticed in my Google Analytics logs that he visited! But he only spent 47 seconds on the site and didn’t visit any links. I interpret that as a discouraging sign, or that he immediately got the gist and didn’t need to read more. Anyway, that got me down and I’m looking for some inspiration to search again. Maybe your thoughts are the ticket? So another summer has gone by and I assume you went out looking again…what happened??? Time is living and money ,can’t say much deal or no deal?